View over the Gorges de l'Ardèche. Dining in the Ardèche introduces the visitor to a department that is virtually entirely agricultural and also one of France’s smallest departments. Chefs work with local produce and products and anything not available locally may be found next door in the Ardèche’s neighboring departments in the regions in of the Auvergne, Languedoc-Roussillon, and Provence-Alpes-Côte d'Azur. N.B. 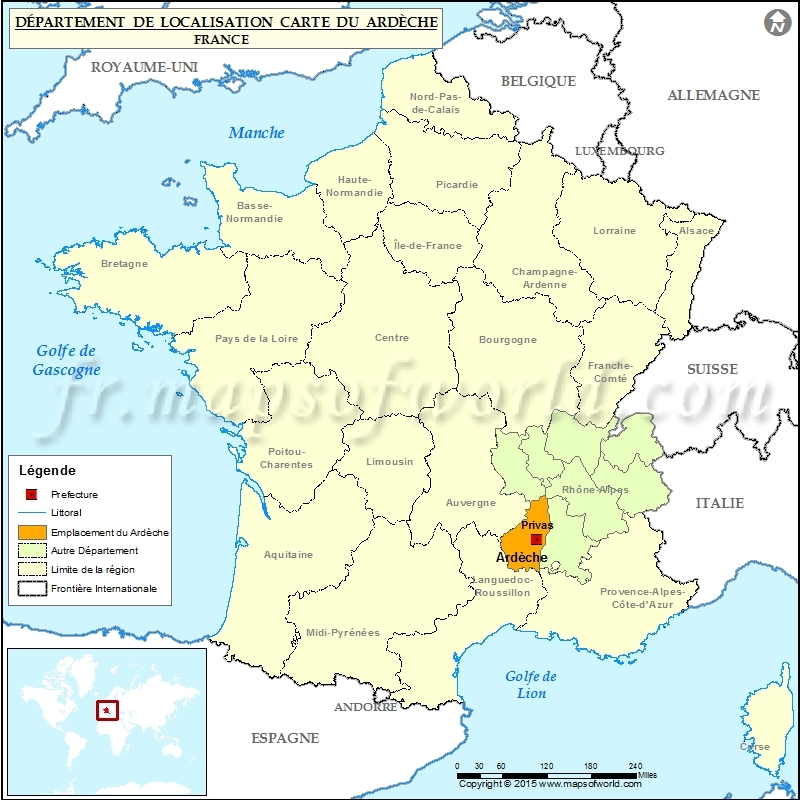 The Ardèche is just 180 km (112 miles) north to south and at its widest point 79 km (48 miles) from east to west. 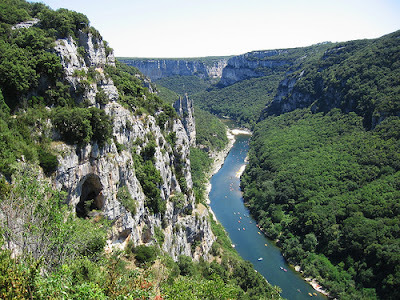 Despite the department's small size the visitor to the Ardèche does needs a car or at least a bicycle or a horse; the only public transport is buses and they are not always direct, there are no trains. Assiette de Saucisson d’Ardèche Poêlée de Champignons Frais Melsat aux Chanterelles Croustillant d’Aubergine au Fromage de Chèvre Frais - A plate of Ardèche sausages lightly fried with fresh mushrooms and the local Melsat pork and egg sausage. All accompanied by Chanterelle mushrooms, crisply fried Aubergines (in the USA eggplant) and fresh goat’s cheese. Areilladou is the name of one of the best traditional fresh goat ‘s milk cheeses. The Ardèche pork sausages come from pigs raised in the mountainous areas of the Ardèche (above 500 meters). 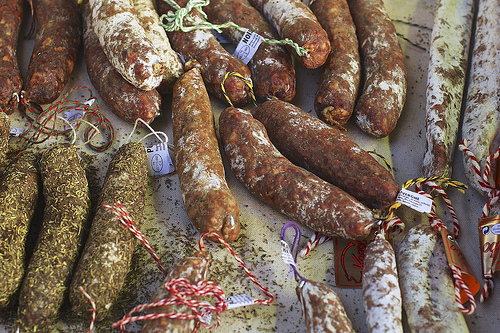 The sausages come in a variety of forms, but apart from different herbs, spices and shapes all are pre-salted, steamed and then air dried for four weeks. 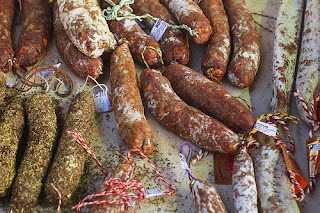 These sausages, with their red tinge, will be offered in a manner similar to salami-type sausages as part charcuterie plate or they may be grilled, or fried. Bar Grillé aux Herbes de Provence et Fenouil, Picodon de l'Ardèche – Grilled European Sea Bass prepared with the Herbs de Provence, fennel and the Picodon de l'Ardèche AOP cheese. Chou Farci aux Châtaignes d'Ardèche AOP– Cabbage stuffed with chestnuts from the Ardèche; usually this stuffing will be mixed with pork and or veal sausage meat. The AOP chestnuts of the Ardèche are the only chestnuts in France to have an AOP and that highlights their unique and consistent quality. Ardèche chestnuts are available all over France; just make sure the label on the packaging says La Châtaigne d'Ardèche AOP. These chestnuts are fresh between August and November and out of the season they keep very well. 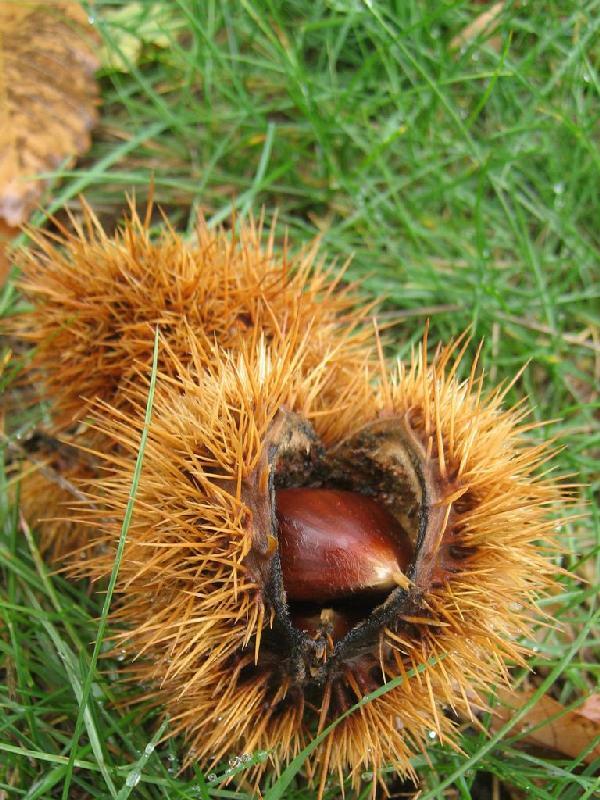 For more about chestnuts in French cuisine click here. The Fete de la Châtaignes d'Ardèche is held annually in the village of Antraigues sur Volane. As the dates seem to move between September and October check this year’s dates with the French Government Tourist Information Office in your home country if you wish to include this special French festival when planning a trip. The Ardèche chestnuts have their own French language website, but their dates for this and next year’s Fete de la Châtaignes d'Ardèche are not regularly updated. 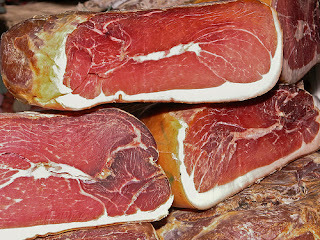 Jambon Cru d'Ardèche – Very thinly cut slices of the Ardèche IGP cured ham. 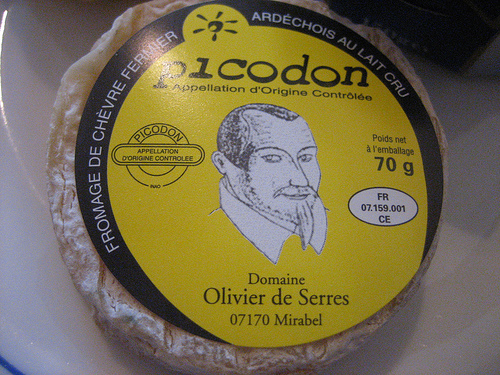 This ham comes from the same area mountainous regions as the Ardèche sausages. The ham is prepared with salt, lard, and chestnut flower and after ten days the ham is hung and cured for between seven to twelve months before being sold. 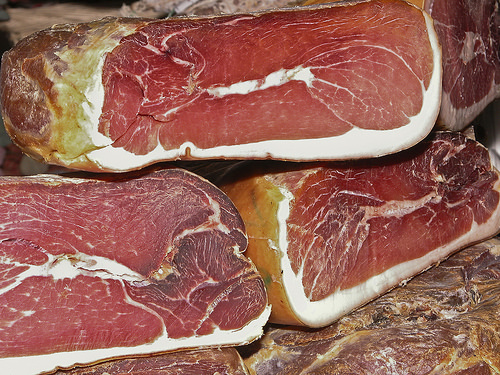 (For more about cured hams in France click here). Magret de Canard au Miel de Châtaigner de l’Ardèche – Duck breast prepared with the honey from the bees and chestnut trees of Ardeche. Râble de Lapin Fermier Rôti à la Bière Brune d’Ardèche et au Romarin Purée Grand-Mère - Saddle of farm raised rabbit prepared with a local dark beer and flavored with the herb rosemary. The dish is accompanied by mashed potatoes as grandma used to make them. Local lager and dark beers are available as well as special craft beers made with chestnut, honey, and verbena; all with 5% alcohol. 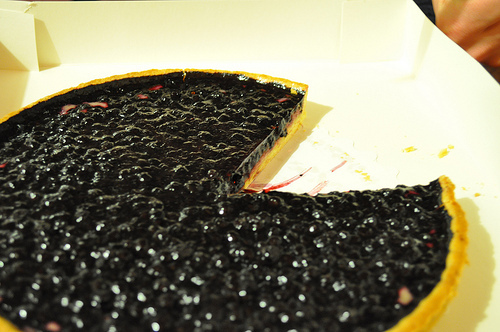 Tarte aux Myrtilles d’Ardeche - A tart made with wild billberries from the Ardèche. Truite Fario d'Ardèche, Crème d’Asperges Brise de Châtaignes, Courgettes à La Tomate, Carottes Braises. A thick cut of brown trout from the Ardeche served with an asparagus cream sauce flavored with small slices of chestnuts and accompanied by courgettes (zucchini in the USA) stuffed with tomatoes and braised carrots. 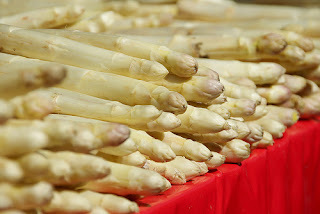 White Ardèche asparagus on sale in a farmer’s market. Tarte Tatin aux Figues, Sorbet Myrtilles de l'Ardèche – A fig tart prepared in the manner of a Tarte Tatin and served with a sorbet made from the bilberries of the Ardèche. The Ardèche’s wines include two AOP wines and the IGP wines include red, rosé, white and lightly sparkling white wines. The Ardèche IGP Chardonnay that I chose was excellent and inexpensive. (For more about the IGP label on wines that have replaced the Vin de Pays labels click here). 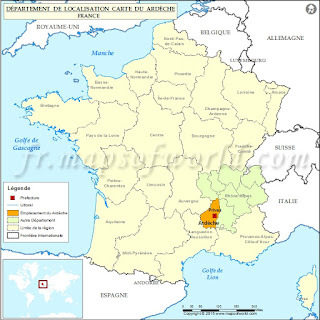 Additionally, since Ardèche is situated on the western bank of the Rhone River, the visitor will also be offered many wines from the Rhone Valley. 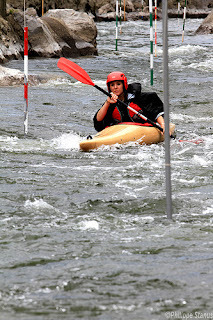 The Ardèche, in the summer is home to campers, hikers, sports climbers, anglers, bicyclists and kayak and canoe enthusiasts. Photograph courtesy of Pays de Saint Félicien. In the Ardèche’s many valleys are cherries, apricots, and peach orchards along with farms that raise sheep both for milk and meat as well as its many goats raised for their milk. The Ardèche is a major producer of goat’s cheese and that is not only the Picodon AOC. Bar or Loupe, the European Sea Bass. Bar or Loupe on French Menus. Searching for the Most Popular Fish in France. Bilberries on the Menu in France - Cooking with Bilberries in France; the Bleuet, Myrtille, and Brimbelle. 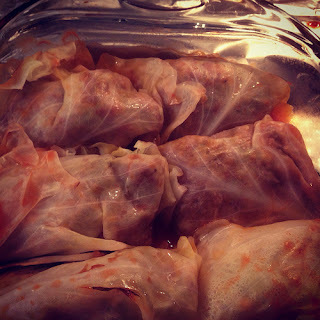 Cabbage; Cabbage in a French restaurant? Of Course, Cabbage is very important in French Cuisine. Miel - Honey. The Many, Varied and Wonderful Honeys of France. Honey on French Menus. The New French Wine Labels. What has changed in French wines? What is an AOP, an IGP, and a Vin de France. The Real Tarte Tatin. The Tarte des Demoiselles Tatin, the Tart made by the Tatin Sisters.